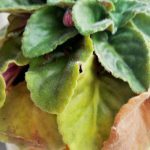 Can African violets get aphids? Mine has what looks to be little white eggs or bugs about 1/64th in length. Thank you.